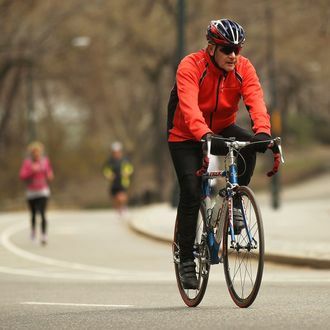 The Daily News hit Central Park the other day, and in short time found numerous cyclists whizzing by in excess of the 25-mile-per-hour speed limit. Zooming through a red light is certainly a different story. But with respect to speeding in the park, outgoing Parks Commissioner Adrian Benepe does not appear so concerned. “If you find a few people going over the speed limit, it’s not a huge problem,” he said. “The cyclists themselves have to be good citizens. To be going 25, 30 [mph] downhill is not that unusual.” In other words, riders, govern yourselves accordingly.